The Second Glass opened this week in the South Front District. Planning for the new restaurant started last year, but in some ways owner Celeste Glass has been working up to this for eight years. 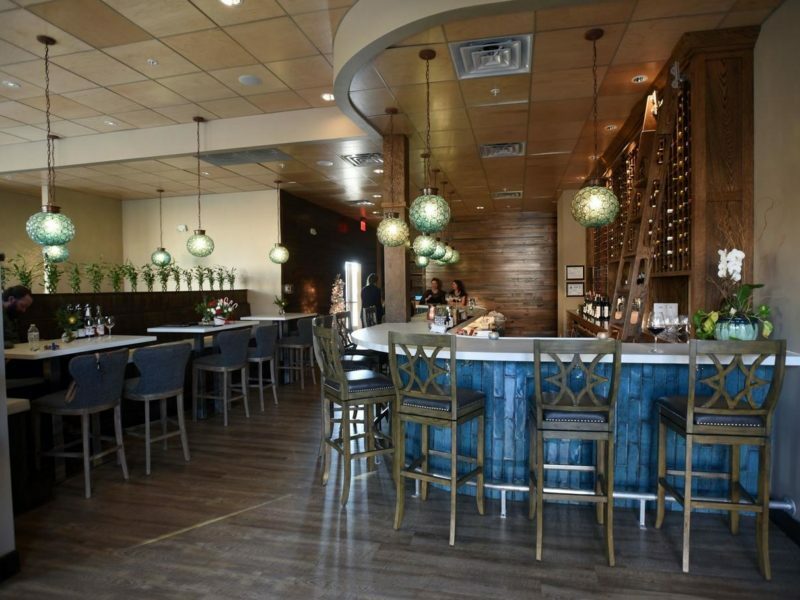 The restaurant – Glass’s second venture, located on South Second Street (Glass likes wordplay) – is what she calls a “real wine bar,” with a bigger, but still focused, menu, compared to The Fortunate Glass. The ‘new guard’: Glass came on the Wilmington restaurant scene in September of 2010, but she’d been paying her dues in the industry for a while. She’d worked fine dining in Charleston, Nashville, and Vail, Colorado, before returning to Wilmington – where her family still lives – to work as a wine rep, consulting with restaurants between the Cape Fear and Crystal Coast areas. Along the way, she spent time working alongside James Doss – who went on to open RX – and Billy Mellon – who opened his restaurant manna around the same time Glass was ready to open The Fortunate Glass, her first venture; Glass focused on wine paired with small plates and tapas-style charcuterie and cheese selections. Glass said she’d never really thought about opening a wine bar, but the absence of them in Wilmington encouraged her to give it a shot. “Wilmington has plenty of good restaurants, and it has plenty of good bars, but it didn’t have a real wine bar, so, I opened one,” Glass said. It wasn’t long after the banking collapse and recession of 2008, and while it was a tough economic time it did push down rents, giving what Glass calls the “new guard” a chance to open their own restaurants. “There were, I think, a lot of people [in Wilmington] who had been doing this for a long time, but – and so, some good things did come from the recession – now, there were lower rents, and these younger people, who had been working in the service industry, could now open their own places,” Glass said. The “new guard” included a focus on local ingredients, innovative cooking, and higher-end wine and spirit programs than most downtown restaurants were offering at the time. But while Pinpoint and manna had relatively ample space to grow, Glass’s location was smaller, and lacked a full kitchen, which limited her options. Outgrowing the Fortunate Glass: Inside, hightops and bench seating opposite the bar are relaxed and uncramped. Glass made the decision back in April of 2017 to take the lease South Second Street (neighboring Satelite Bar and Block Taco). It gave her the opportunity to push beyond what she’d done on South Front Street. Unlike the rest of the area, which Tribute properties has renovated from dilapidated warehouses, the building that houses The Second Glass was built from the ground up, utilizing cargo-container elements to match the industrial vibe of the rest of the South Front District. New construction meant a long wait, but it also meant Glass could have a hand in the layout and design of the new space. “I had a chance to work with the architect, the engineer. I had a really good team and I was able to pick out elements I wanted – I was able to create a feel and a flow to the space, which is really important,” Glass said. In part, that meant breaking free from the limitations of the smaller South Front Street location where she operated since late 2010. “There was only so much space, only so many seats, only so much I could do — I think I really just maxed out,” Glass said. The new space has a lot more to work with: room for spirits and a mixology program, more inside and outside seating, and – in general – the ability to take things further. On the new menu, wine is an ingredient: A big part of that is a full kitchen, where Chef Ryan O’Jampa – who came with Glass from the Front Street spot – is chef. Glass said she and O’Jampa pushed the old kitchen as far as they could, but now that they have a full-sized and fully-equipped kitchen, it’s a different story. “I saw the talent in [O’Jampa], and we’ve worked well together for a few years, but I knew to really bring out his talent he – well, needed the right equipment. I mean, we’ve got a full kitchen now, so it’s a different level of what we can do for entrees, for food in general,” Glass said. The menu is focused, with a dozen starters and small plates and four seasonal entrees: modern-American takes on chicken, beef, lamb, and fish (red drum). Like her fellow “new guard” restaurateurs at Pinpoint, RX, and Manna, Glass sources things as locally as possible, including Kyle Stenersen’s chicken –– raised in Scott’s Hill, the birds have become the go-to choice of several local chefs. The menu will rotate seasonally: “Here I am joking like we have seasons,” Glass said, laughing – but adding that, both the menu and wine list will adapt to the weather, whatever that happens to be. One thing that sets Glass apart is her idea of what a wine bar should be, which means quite a bit of work for finding wines that don’t just go with certain dishes, but that are actually part of those dishes. Sometimes that means a continuity – a lamb shank served with same wine it was braised in, sometimes more of a pre-planned pairing. “I think of wine as compliment, but also as an ingredient,” Glass said, adding that she’ll work with O’Jampa on individual dishes to see how they work with certain wines. A peppery Carménère or spicy Zinfandel might act as part of the seasoning, while other wines might be used for contrast. “If we’ve got a really buttery chardonnay, then we’re going to hold back on the butter in the dish, because you’re getting it from the wine,” Glass said. Room to grow: A wine-cellar – visible through the front window when you approach the restaurant – can hold up to 1,000 bottles, plenty of room to grow. Between the bar and the custom wine-cellar – another benefit of ground-up design – The Second Glass has room for about 2,000 bottles, although Glass hasn’t pushed the racks to capacity. Glass said she doesn’t want to get tied down to particular vineyards or labels. “There’s so much change in the climate – we have fires, frost, storms – you have to stay on top of it,” Glass said. And that, Glass said, is part of the fun. Full story on Port City Daily.